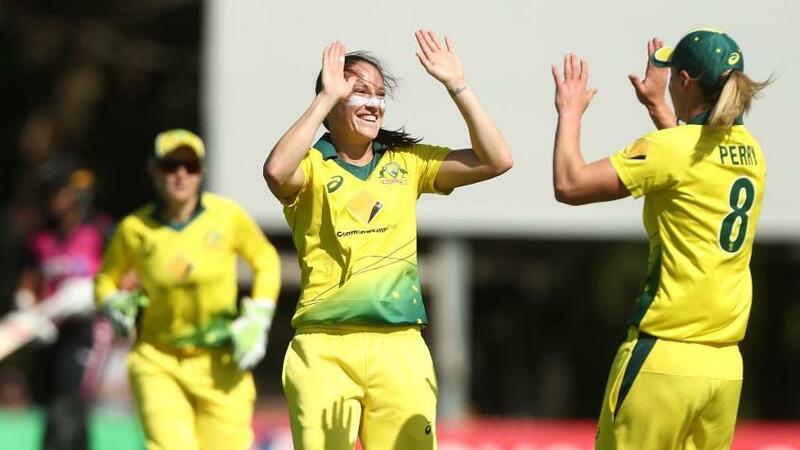 Half-centuries from Alyssa Healy and Elyse Villani and a strong bowling performance led by Megan Schutt ensured Australia took a winning 2-0 lead in their three-match Twenty20 International series against New Zealand. Suzie Bates’ solid 77 off 52 balls went in a losing cause as the hosts chased down the White Ferns’ 145/8 in 18.5 overs with six wickets in hand at Allan Border Field in Brisbane on Monday, 1 October. This is Australia’s first bilateral T20I series win against their old rivals since 2012. The @SouthernStars win by six wickets! There was a wobble late on, but half-centuries from @ahealy77 and @ElyseVillani help the hosts topple the @WHITE_FERNS for a 2-0 lead! New Zealand came out fighting to defend a below-par total. Lea Tahuhu bowled Beth Mooney for a duck in the second over, and Ashleigh Gardner was run out. Healy, though, was strong around the ground, striking 10 fours in her 41-ball 57. Her wicket, lbw to Sophie Devine with one that was pitched outside off but moved in, gave the visitors a glimmer, but the hard work had been done. Meg Lanning’s run of not being dismissed in international cricket since her return from a shoulder injury earlier this year was finally ended by Amelia Kerr, even as Villani chipped away at the target. Villani didn’t need to do anything flashy, getting her half-century off 39 balls and striking the winning runs with her fifth boundary of the day. Earlier, after Lanning put New Zealand in, Schutt teamed up with Ellyse Perry to get the early breakthroughs. She had the dangerous Devine caught by Perry at the ropes and Jess Watkin followed in her next over as the visitors were reduced to 17/2. Bates, though, remained unperturbed. She attacked the spin of Gardner and Sophie Molineux, and added 60 with Amy Satterthwaite, the captain. Satterthwaite was handed a life on 26, but Schutt made up for the dropped catch by holding on at the very next opportunity to send her back for 27 off the bowling of Delissa Kimmince. Dropped on 7, Bates made the Australians pay by going on to bring up her fifty. She was fearless in stepping out and attacking: her innings included 11 fours and two sixes. Perry, denied Bates’ wicket early and struggling to find her rhythm when she bowled three no-balls in a row, finally got the big one, getting the former New Zealand captain to edge behind to a diving Healy. It marked the start of a strong fightback by Australia, with the ball and on the field. The middle and lower order couldn’t capitalise on the strong start, adding just 23 in the last five overs. Schutt finished with 3/15 while Kimmince was impressive with 1/17. The final T20I will be played on Friday in Canberra.